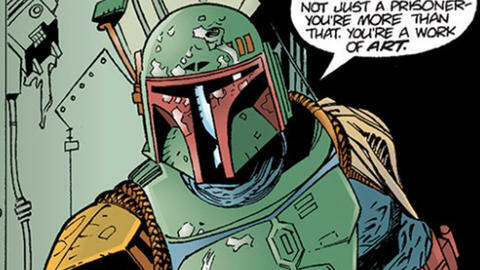 Boba Fett makes a comeback as Shadows of the Empire falls! A year before “Star Wars Special Edition” heralded the return of the original trilogy to the big screen, Lucasfilm embarked on an unprecedented and ambitious multimedia effort called “Shadows of the Empire.” This “interquel” story set between “The Empire Strikes Back” and “Return of the Jedi” included no movies, but just about every other form of popular 1996 media chipped in: a book by Steve Perry, a Nintendo 64 game from LucasArts, an orchestral soundtrack composed by Joel McNeely, a toy line from Hasbro, and more. Not to be outdone, Dark Horse released a six-issue comic book series by writer John Wagner and artist Kilian Plunkett. 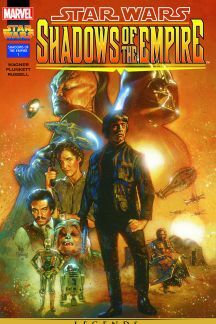 The SHADOWS OF THE EMPIRE comic touches on elements of both the book and the game—the adventures of Leia, Lando and Chewbacca, and the Rebel mercenary heroics of Dash Rendar, respectively—while also delving more squarely into the life of the galaxy’s most infamous bounty hunter. From outwitting IG-88 aboard the Slave I in space to overcoming a team-up by Bossk, 4-LOM, and Zuckuss, Boba Fett lives up to his reputation—no one’s going to steal Han Solo in carbonite from him before he can claim his massive reward from Jabba the Hutt. Astute fans will also appreciate direct ties to “Return of the Jedi,” such as how the Bothans secured the plans to the second Death Star and the origins of Leia’s Boushh bounty hunter costume. Though “Shadows of the Empire” now resides as part of the “Star Wars Legends” continuity, it did introduce fans to the criminal organization known as Black Sun. Also, Dash Rendar’s ship, the Outrider, can be seen leaving Mos Eisley in the Special Edition of “A New Hope.” The success of the comic even spawned a sequel in 1998 called STAR WARS: SHADOWS OF THE EMPIRE – EVOLUTION.